Samsung has modified its Galaxy Tab 10.1 tablet in Germany in an attempt to avoid potential issues with design rights infringement, reports Florian Mueller of FOSS Patents. The new version, the Galaxy Tab 10.1N, has a new bezel design that wraps around to the front of the device more aggressively. Mueller says that it is likely that this design change was brought about by a collaboration between Samsung’s engineers and its legal team in an effort to avoid additional design rights trouble from Apple, although there is no guarantee that this change will fix matters completely or prevent issues in the future. This redesign puts Samsung in the unenviable position of having to strike a balance between ‘what a tablet must be’ and ‘too close to Apple’s design’. The tweaking of the bezel seems like a fiddly way to get around Apple’s design rights litigation in Germany, but if it works, it works. 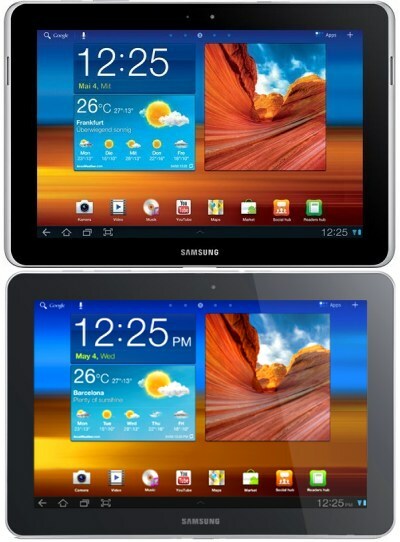 German tech site Mobiflip.de has a side-by-side comparison of the new Galaxy Tab 10.1N (top) and the older Galaxy Tab 10.1 (bottom). A critical person might wonder if it the design shouldn’t just be altered significantly enough to be completely clear of trouble. But Samsung has been arguing all along that this is pretty much exactly what a tablet should look like and that the design was inevitable and therefore shouldn’t be allowed to be exclusive to Apple. In the end though, a lot of things seem inevitable once they’ve been seen for the first time. What do you think, is the design of the iPad a universal constant, the only way that a tablet can be, or is Samsung simply copying Apple’s design?